Thai massage therapist doing massage to woman lying on green grass outdoor. Man doing traditional yoga massage for relaxation and treatment body. Close up woman receiving Thai massage outdoor. Masseuse doing Thai back massage to woman lying on mat in summer park. Caucasian woman practicing Thai massage outdoors. Hand stretch by Thai yoga therapist. Body care and wellness. Thai back massage on green grass. Female therapist doing Thai massage to mature woman lying on mat. Male masseur doing hip and leg treatment outdoors. Close up young woman is getting Thai massage by therapist lying on mat in park. Young woman is getting Thai massage outdoor. Stretching exercise with yoga trainer. Body care treatment by Thai massage. Massage therapist doing Thai massage to woman. Mature woman getting traditional thai stretching massage by therapist. Massage stretching therapy. Therapist doing healing treatment on mans back. Yoga therapists working with senior people outdoor. Thai massage for couples and friends. 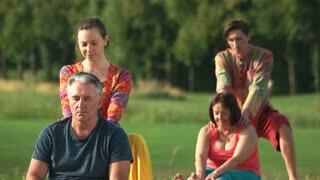 People receiving Thai massage outdoor. Professional massage therapists doing Thai massage at green meadow. Body massage therapy. Thai Yoga Therapy. Middle aged man receiving massage by therapist in traditional Thai massage position. Health and wellness concept. Two women performing Thai massage. Female yoga trainer helping doing exercise to mature woman. Body stretching for health.